Nail art is fun, relaxing and rewarding, but sometimes it can be a little complex. If you’re in a hurry or you find out that you can’t recreate a design you really want it can be extremely frustrating. You want to enjoy the holiday season and share the cheer with your nails expressing what you love about this holiday season. So why not try decals? They are super easy to apply your nails and you can put them over any nail polish you wish. Decals are a great choice for those who want a complex design without hard work or taking up too much of your time. Let’s face it between making holiday foods, decorating trees and buying presents it can get a little hectic. So here are some amazing nail decals you will definitely want to purchase that represent Christmas Movies we all love and cherish. Frosty the snowman isn’t just a cute little song. We have been loving the little cartoon that has come on FREEFORM formally ABC for a couple decades now. It’s not only a part of Christmas tradition to watch this fun little cartoon, but it’s a part of our souls now. Okay, that may be going a bit far, but the basic thing you should be taking away here is that there are fantastic nail decals that are from this nostalgic cartoon. What better way to celebrate the holidays than to have your favorite snowman on your nails? In this particular set, you get 48 nail decals and they are high quality. These decals are by the company Enigma Design Company. They also have their own line of nail polishes and are very reputable. Get the look here for around 4.95. Just like Frosty the snowman Rudolph, the Red Nose Reindeer had a cute little cartoon that we have watched year after year on FREEFORM. For decades this has been a huge part of Christmas tradition for many families. Bake some cookies while this movie is on and not just any cookies, but the cookies that Santa will be eating Christmas Eve. Rudolph is a character that is a part of Christmas stories and has won over our hearts. He was a bullied little reindeer who saved the day and nothing could honor the season or your nails as to have him leading the way on your hands. 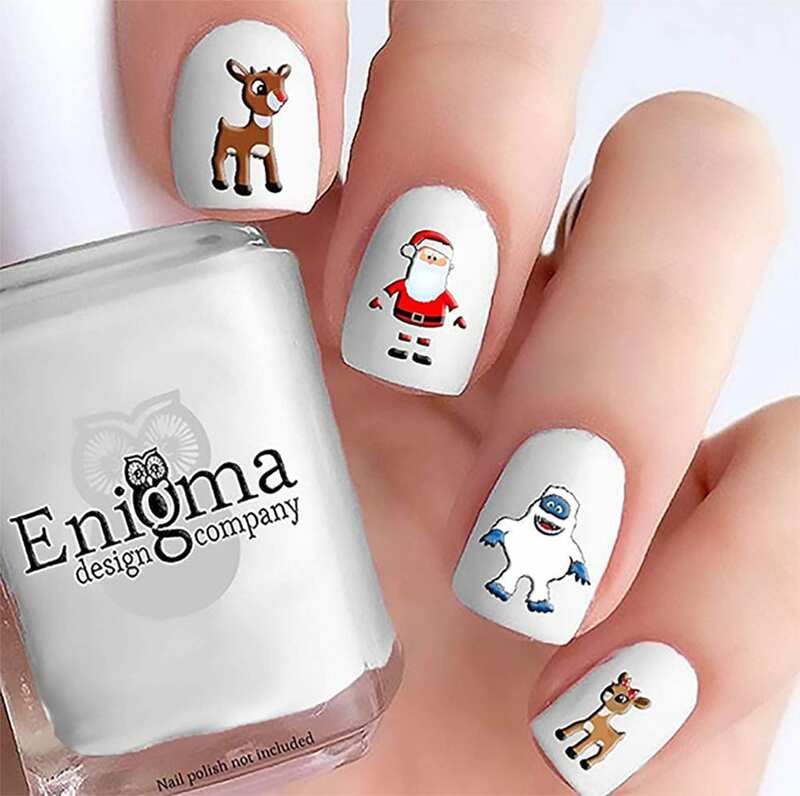 Let Rudolph’s nose shine with these adorable decals on your next manicure. Get them here for around $4.95. Again these are by the Enigma Design Company so you know you’re getting quality here for a good price. While the minions may not have a Christmas or holiday movie they do have some holiday nail decals that are so adorable. Who doesn’t love the minions from Despicable Me? They are so cute and funny. These decals are from One Stop Nails and it may be your one stop shop for the season after you see these cute little seasons on your next manicure. Get the look here for around $5.00. Well worth it for a cute bit of holiday evil on your hands, literally. The Grinch Whole Stole Christmas is another holiday classic. The Grinch who had no heart and hated Christmas ended up having the biggest heart full of holiday cheer of all. This is the kind of story we all love and definitely the representation we want on our hands for the holiday season. These decals have Max the Grinch’s cute dog and a few other Who’s from Whoville with a whole lot of Grinch. This is also the perfect look for this year because The Grinch just got a new movie that has come out to the theatres. This reboot and your nails will go hand in hand. Get the look here for $3.99. Disney’s Frozen may not be a Christmas movie officially, but it does take place in the winter and it is frozen. It’s got a fantastic snowman with a great sense of humor. If you love Frozen then you need to check out these cute nail decals again by One Stop Nails. Get Anna, Elsa, Snowflakes, Olaf and plenty more characters on your next manicure. Go here to get the look for $7.00. I should also mention that these are peel and stick not waterslide decals. They may be a bit easier to use. While they are for adult nails you can probably use these for the little ones in your crew too. So if you have a child who wants to match you with their mani or pedi these are the decals you will want to get. Overall, these decals will last a long time and look great on you! They are all high quality and beautifully crafted. Get some Christmas or Holiday movie nails in time for Christmas and order from these amazing companies today.